...if the Cards keep winning--they're one up on the Dodgers in their NLDS as I write this, with game two tonight--and the Orioles, who are two games up on the Tigers in their ALDS, do the same. If this comes to pass--and I hope I haven't jinxed both teams by suggesting the possibility--I'll be OK with whichever team wins, though I'll give a slight rooting edge to the O's, despite their being in the Phony Baseball League, since they haven't won a Series since 1983, a ring-dearth even longer than that of the Mets. I also have a soft spot for the O's since they were victors in the first Major League regular season game I attended, in the summer of 1970, when a two run homer off the bat of Boog Powell iced the game against the Yanks. 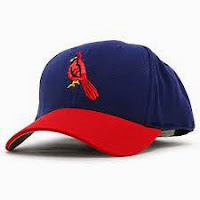 I've often said, though, that if I had to pick a baseball team on the aesthetics of their play and the competency of their organization I'd pick the Cardinals. Like my Mets, they're in the league that plays real baseball, without the designated hitter. They have a great tradition going back to the "Gas House Gang" of the 1930s, whose spirit seems to have survived through many generations of players. One interesting aspect of a Cards/O's Series is that it would match up two former crosstown rivals. 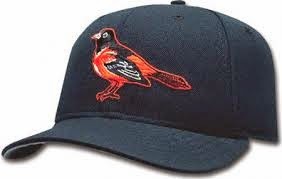 Until 1954, the Orioles were the St. Louis Browns. Other interesting Series match-ups are also possible. We could have a rematch of the 1985 all-Missouri Series, won by the Royals over the Cards, or the 2002 all-California Series, in which the Angels beat the Giants. Should Detroit come back from their 0-2 deficit and progress from there, we might even have an avian/feline Series, pitting the Cardinals against the Tigers. Big dinos! Spinosaurus and Dreadnaughtus. When I first saw an image of Spinosaurus aegyptiacus sometime way back when I was a kid crazy about dinosaurs--the image had no caption indicating the species--I thought it was someone's silly conflation of a Jurassic or Cretaceous theropod with a Permian era sail-backed synapsid like Dimetrodon. I later learned that it was a real dinosaur, that its fossils had been found in Egypt, but that the only known fossil remains had been destroyed in a bombing raid on Munich during World War II. Thanks to a nomad in Morocco, who found fossil bones that came to the attention of paleontologist Nizar Ibrahim, a post-doc at the University of Chicago, paleontologists there were able to create a reconstruction of Spinosaurus that strongly indicates that, like a present day crocodile (or duck), it had a semi-aquatic life. It was larger than any other known carnivorous dinosaur, including Giganotosaurus. Indeed, it was likely piscivorous, dining on the large fish that swam in the shallow waters of the coastal region that was North Africa in the Cretaceous. My last post on dinos was about the smallest dinosaur yet discovered, Ashdown maniraptora. Now there's a new biggest, discovered in Argentina, which now vies with China as the richest source of new dinosaur discoveries. It is, of course, a sauropod, one of those immense, long-necked, long-tailed, big-bodied herbivores we boomers knew in our childhood as Brontosaurus, but later learned was properly named Apatosaurus (the story of how this happened is here). This was sad news for the Piltdown Men, who took their name from what may have been the greatest paleontological hoax ever. As we boomers grew older, we learned of other sauropods, like long, slender Diplodocus and Brachiosaurus, with its towering neck. In recent years a large number of new sauropod species have been found in places like Brazil and Utah. Now, the biggest yet has been found in Argentina, weighing 65 tons, more than twice the weight of Brachiosaurus; indeed, more than an empty Boeing 737. It's been given what I think is a very appropriate name: Dreadnaughtus. I haven't included an image of Dreadnaughtus because Anne Elk (see clip above) has explained what all sauropods look like. If you still need help, there's a picture of one on the wall behind. Addendum: I neglected to credit the Spinosaurus image to "Barry's Dinosaur Info" in Dinotopia. "Barry's", in turn, credits the image to Arthur Weasley. Perhaps the same vein, I learned through "Barry's" of a dinosaur called Dracorex hogwartsia. Yes, only in a division as bad as this year's NL East could a team ending the season five games under .500 earn a second place finish, and yes, they have to share this honor with their frequent nemeses, the Braves. Still, just a few weeks ago I would have been happy to see them equal their third place finish of last year. Indeed, it seemed more likely than not that they'd sink to the dismal fourth of their preceding three seasons. But unlike so many previous seasons, the Mets sparkled in September, going 15-10. 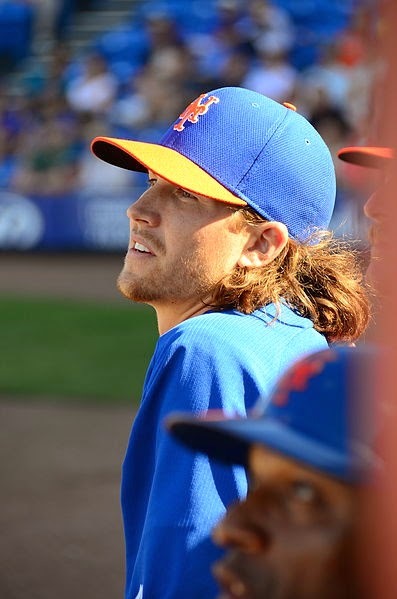 On the 15th of the month, rookie pitcher Jacob deGrom (photo) started against the Marlins and struck out the first eight batters, which tied a Major League record. As a precaution, management took him out of the rotation for the remainder of the season. After that, the Mets were 7-4, including a three game sweep of the Braves and a 2-1 series with the Astros to finish things off. The Mets also ended the season with a six run advantage in overall scoring, despite their difficulties in bringing in runners in scoring position and their still sketchy bullpen. Looking ahead, the Mets have a promising set of young arms, including deGrom and Matt Harvey. Some fans are complaining about Harvey's having attended Derek Jeter's final game at Yankee Stadium instead of being with the Mets in their game against the Nats that evening, despite Harvey's being on the DL. I say it was a classy move, although I do wish he'd have worn his Mets cap instead of a Knicks one.